Play if… you are a science nerd or love your gadgets. Avoid if… you don’t know the difference between alternating current and direct current. Don’t worry, you are not alone. You have one of the greatest minds in history on your side, Nikola Tesla. Tesla’s legacy adventure offers a rich setting intertwined with specially designed puzzles submerging you into a wondrous world of fascinating mechanical devices. Strange noises and lights, weird contraptions and fun gadgets will both guide and distract you on your way to becoming a hero. Choose this ExitGames adventure if you want to learn about one of history’s most fascinating minds and uncover some of his secrets that enabled him to invent machines light years ahead of his time and literally bring light to the world. Staging Area: A very comfortable lobby with plenty of seating. Metro Access/Parking: This location is directly in the city center, right near Ban Jelačić Square. Uber works well in Zagreb. Description of the room: A large laboratory with tons of gadgets, a huge bookcase, and what appears to be a bar (it’s not… no liquor) on the side of the room. There is also a very large door on one side of the room. Understanding of the Mission: There is a meteor hurtling towards Earth, with enough mass to produce a force upon contact that will destroy the entire planet. All nations of the world have banded together to try and stop it, to no avail. Did the room challenge the entire team? Oh. My. God. YES!! Mike and Heather infiltrated Tesla’s laboratory in search of one of his experiments to save the Earth. Worth the time and money? Absolutely, yes! Avoid if… you are a church-going, God-fearing person. 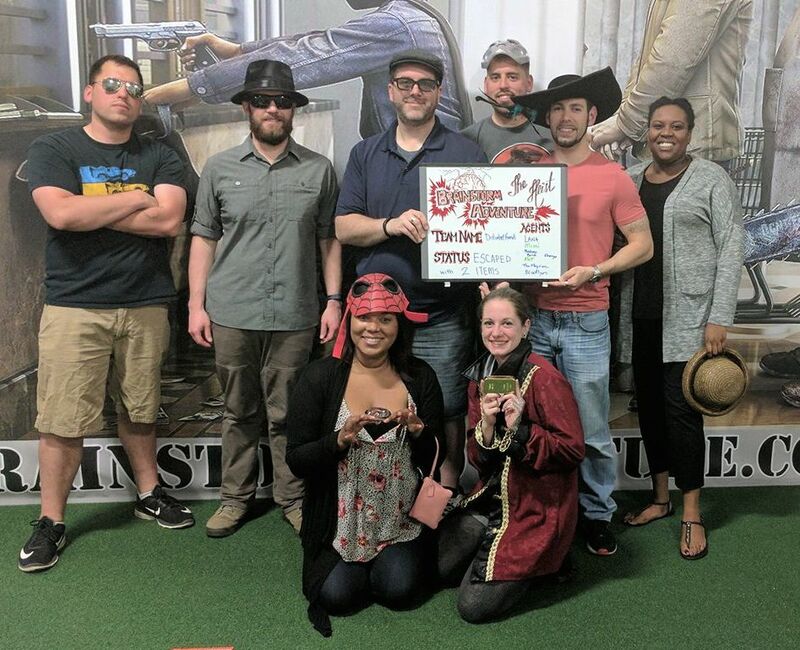 Description (from the company website): “Seven Deadly Sins” is the most unique, and easily the most challenging escape room experience we’ve ever created. In five and a half “ancient” and elaborate rooms, you and a group will be tested to your absolute limits to overcome intricate puzzles, time-sensitive obstacles, and a difficult environment. More intense than our original rooms, all of your senses will be tested to escape the seven sins. You enter through Pride (the first room) – will you leave with Pride, or be Envious of the ones that escape? Party Size: Up to 8. Staging Area: It’s in an old movie theater that is supposedly haunted, so pretty damn creepy. Metro Access/Parking: Not metro accessible at all. The theater is in a strip mall so there is plenty of parking. Description of the room: You walk into a circular room with a table in the center, at TV on the wall, and 7 doors (including the one you walked in through). Understanding of the Mission: Solve the puzzles to figure out how to get out with your Pride intact. Time Remaining: Exactly 11 minutes. Play if… Whips and chains (particularly chains) excite you..
Avoid if… They don’t and you are afraid of clowns. Description (from the company website): You and your task force of detectives have spent months chasing the infamous criminal clown known only as Joker. Your investigation has brought you precariously close to capturing this clever crook, and you’ve grown confident: sure that this final chase will land Joker in ‘cuffs and custody. You were right on his tail, and then… It was a trap! You and your team awake disoriented, in a disturbing basement, chained to chairs. Joker, indulging in the dramatic, has hidden a bomb set to detonate in one hour. The minutes are counting down fast. You and your team will have to rely on collaboration, and your investigative prowess, to free yourselves, disarm the bomb, and escape with your lives. Harness your courage to decipher this trap… Otherwise, this will be your last blast! The game begins with you and your team chained to chairs (YES, WE REALLY MEAN IT. IF THIS CONCERNS YOU, CONTACT US) in a creepy basement. Metro Access/Parking: No metro nearby, but plenty of parking. Description of the room: A dingy and DARK basement with chairs and chains and some deranged clown-themed and graffiti artwork. Understanding of the Mission: You’re kidnapped by the mysterious Joker and locked up in his basement. 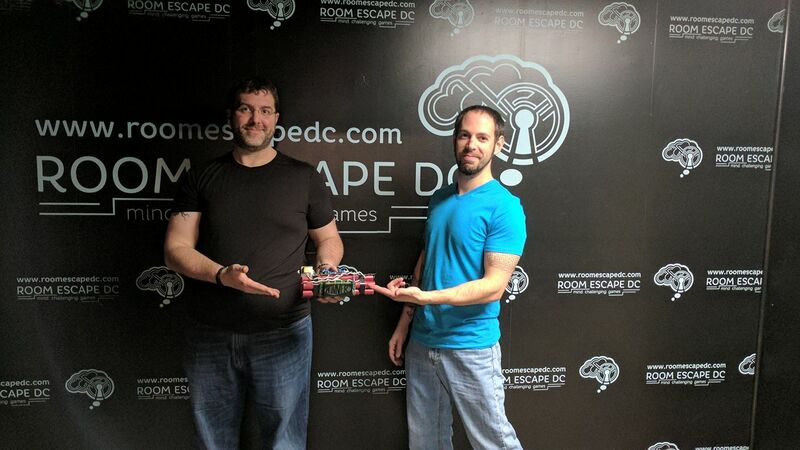 You have 60 minutes to free yourself from your chains (literally) and escape before the bomb detonates. Members of our team (other than the ERG): Stephanie, Brittany, Corey, Tara and Eric. 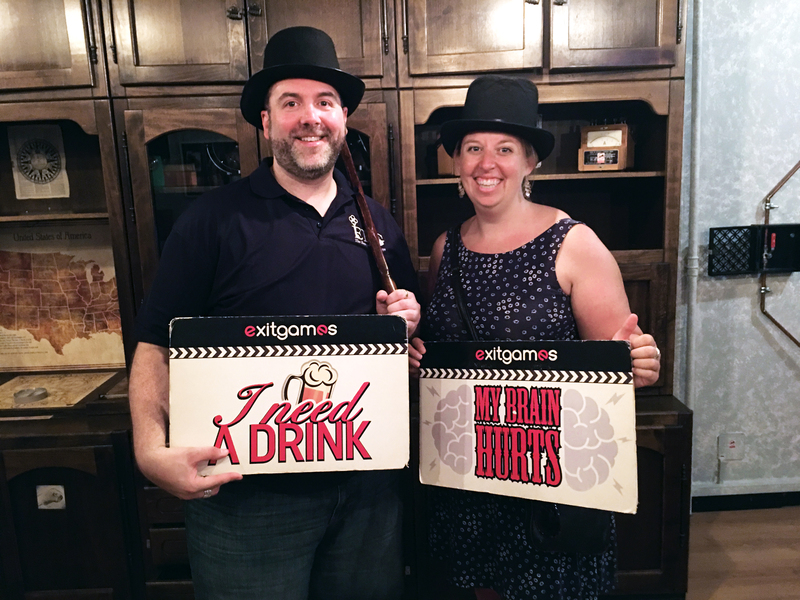 Team Disturbed Friends (Mike, Jason, Stephanie, Brittany, Corey, Tara and Eric) escaped the evil clutches of the Joker! 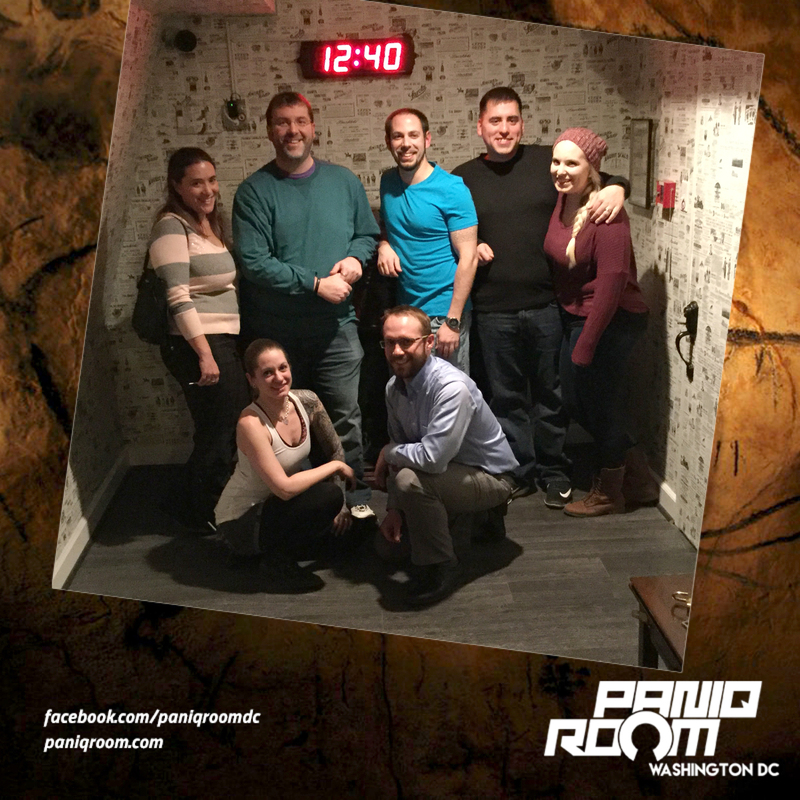 Photo courtesy of Room Escape DC’s Facebook page. The Wine House – we stopped in for a glass of wine and dessert.